Within hours of the tragic murder of 32 students last week on the campus of Virginia Tech, liberals both at home and abroad began to cry out for "gun control," as if the two handguns that were used in the killings were more to blame than the disturbed student who pulled the trigger. While Cho Seung-Hui blamed everybody else in his chilling videotaped rant, the liberals and many in the media also wanted to place the blame on something else for Cho's cruel and immoral actions, once again exploiting this tragedy to push their agenda of taking away guns from law-abiding citizens. Before leaping to such emotional conclusions, however, it would be wise to closely examine our history and our law, and ask ourselves why Virginia Tech's supposedly "gun-free" campus policy did nothing to protect the students and professors killed and injured there. Our Founding Fathers believed that the right to keep and bear arms was a natural right given by God and essential to the preservation of life and liberty. Alexander Hamilton acknowledged that "the Supreme Being ... invested [man] with an inviolable right to personal liberty and personal safety." James Wilson – one of the first Supreme Court justices and a signer of both the Declaration and the Constitution – wrote that taking the life of an attacker is allowed "when it is necessary for the defense of one's person or house." This "great natural law of self-preservation," Wilson continued, "cannot be repealed, or superseded, or suspended by any human institution." I'm sure that Virginia Tech's administration intended to provide a safe environment with its policy banning guns, knives and other weapons from the campus, but instead the school placed its students and staff in very real danger, entirely vulnerable to someone like Cho who violates the weapons policy with the intent to harm. If students and professors had a means of armed self-defense, then perhaps more lives would have been saved or the tragedy averted altogether. After all, Virginia Tech is not the only university in Virginia to have suffered a shooting spree on its campus. Just five years ago at Appalachian School of Law in Grundy, Va., a disgruntled law student killed two faculty members and a student and wounded three others. But in this case, the killer was eventually restrained and held captive for police by two courageous law students who each retrieved their own handguns from their vehicles. In 1997 in Pearl, Miss., a 16-year-old boy shot and killed two and wounded several others at his high school before he was finally subdued when an assistant principal, like the Appalachian law students, grabbed his handgun from his vehicle and bravely put a halt to the violence. The right to keep and bear arms is not just a means of protecting life, but an indispensable safeguard of our liberties against oppressive government. Our Founding Fathers enshrined in the Second Amendment that this right of the people "shall not be infringed" because "the security of a free state" requires a "well-regulated militia." Liberals choosing to ignore the historical evidence claim that this is an outdated "collective" right of the state, not the individual. But in Parker v. District of Columbia on March 9, 2007, the D.C. Court of Appeals found that the right to keep and bear arms was an "individual right" held by "the people," and that it "existed prior to the formation of" the Second Amendment. 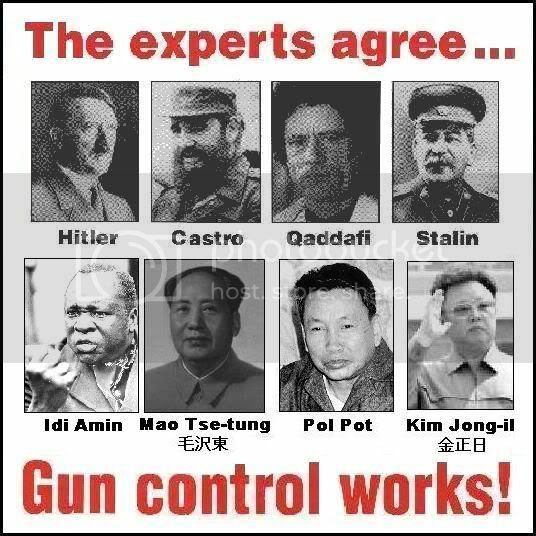 Tyrannical governments like those of Nazi Germany, the Soviet Union, China and Cuba all disarmed their citizens before the unprecedented oppression and murder of millions began. Back in 1833, Justice Joseph Story wrote in his "Commentaries on the Constitution" about the "importance" of the Second Amendment "as the palladium of the liberties of a republic since it offers a strong moral check against the usurpation and arbitrary power of rulers." History has indeed proven the truth of Story's comment and what every oppressive government knows: You must take away the people's guns before you can take away their rights and liberties. In the end, Virginia Tech's policy of banning weapons from campus protected students and professors only as well as the paper upon which it was written. It certainly did not stop Cho; but it did prevent those killed from defending themselves against an armed killer. While much has been written about Cho's serious mental and social problems, the truth is many factors contributed to his state of mind on April 16. But for his immoral and destructive acts, he alone is ultimately responsible. To suggest that in the wake of the events at Virginia Tech we now surrender one of our most valuable rights, the inalienable right of self-defense, is unwise and dangerous. Our right to keep and bear arms not only keeps America free – it keeps Americans safe. “Just because you do not take an interest in politics doesn't mean politics doesn't take an interest in you.” --- Pericles, 430 B.C. First and foremost, the Second Amendment is all that stands between liberty and tyranny. Our opposition knows this to be true, hence their nefarious attempts to deny us our God given right to self defense that the Founders so wisely codified into the Second Amebdment and affirmed with their actions and words.